Long lasting moulded-in Clinical Waste sign. Stainless steel handle and 2'' capped drain outlet. Mounted on 2 fixed and 2 swivel nylon castors, with thread guards. H x W x L 1025 x 645 x 1130mm. Clinical waste trucks are essential pieces of equipment for the removal and transportation of medical waste to the incinerator or other facilities licensed to dispose of the waste. We are offering you our generous 400 Litre capacity trucks which allow a large amount of waste to be moved at once, meaning fewer trips to the incinerator and back. They are mounted on 2 fixed and 2 swivel nylon castors and have a stainless steel handle, these features allow them to be moved easily around wards and down corridors. Another feature is a long lasting moulded-in clinical waste sign and the bins are produced in Yellow, both of these contribute to the awareness that there may be hazardous waste within. 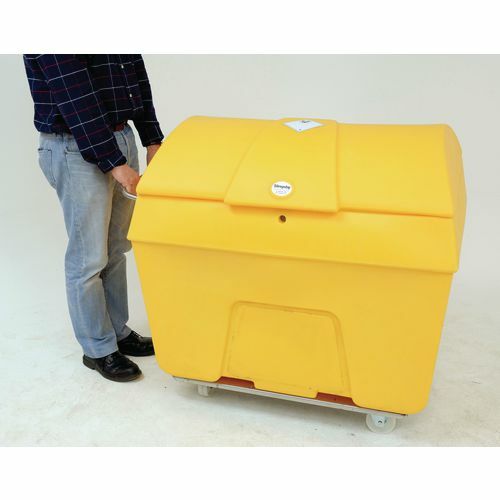 There is a built in lock on the truck bins, ensuring that any waste deposited is safely stored inside until it goes off to be disposed of, reducing the risk of someone being able to hurt themselves or risk severe illness or infection.Our trucks are hygienic and secure, with a 2" capped drain outlet, they are easy to sanitize. Their dimensions are 1025mm x 645mm x1130mm and they come with FREE UK Delivery.